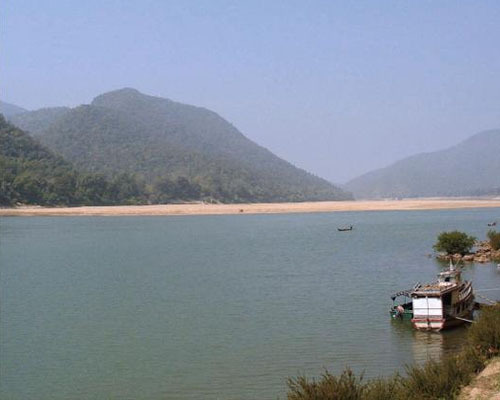 The 857km long Mahanadi originates from a hill in the Sihawa mountain range situated southeast of Raipur. Before ending its journey in the Bay of Bengal, near Cuttack in Orissa, the Mahanadi flows from Raipur via Bilaspur, Bastar and Raigarh in Madhya Pradesh. On the Mahanadi is one of the largest dams in India – the 4.8km long Hirakud Dam in Sambalpur, Orissa. The tributaries of the Mahanadi are the Shivnath, Hasdo, Mand and the Ib on the left bank, and the Jonk, Ung and Tel on the right bank. In the Matsya and Brahma Puranas, ancient Hindu scriptures, the Mahanadi has been referred to as Chitrotpala.